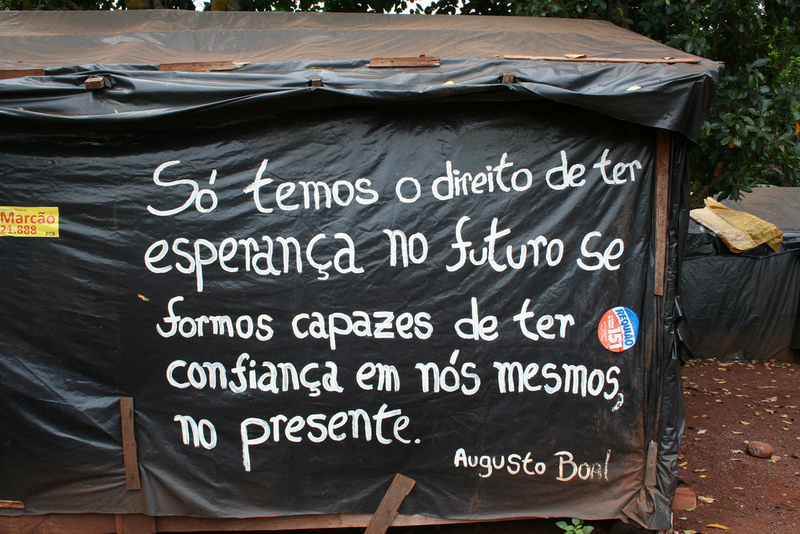 From the 8th to the 13th of November 2010, ESCR-Net's Social Movement and Grassroots Working Group (SMWG) celebrated its Human Rights Mutual-Learning Workshop and 3rd Solidarity Visits together with the Movement of Landless Workers (MST) and Terra de Direitos at the Escola Nacional Florestan Fernandes in Guarerema, São Paulo, Brazil. The gathering, "Working Together to Secure the Human Rights to Land, Territory and other Natural Resources," brought together 25 leaders of social movements and grassroots organizations from 11 different countries to advance a human rights analysis of land, territory and other natural resources and to build horizontal ties of solidarity and support in this common struggle. The event was composed of a Human Rights Mutual-Learning Workshop, the 3rd Solidarity Visit and finally a Social Movement Working Group Strategy Session. Check out the detailed program of activities, participant bios and other substantive background papers below. Other audio and video from the Workshop and Solidarity Visits will be released on this website soon. A Human Rights Mutual-Learning Workshop was held during the first two days of the visit, as a way to share concrete experiences using human rights to defend the right to land, territory and other natural resources at the national, regional and international level. Through this exchange, participants were able to share lessons and strengthen each others' capacity to incorporate and utilize human rights strategies in their organizing and advocacy over land, territory and natural resources. Our first day began with a keynote address from a member of the MST National Directorate to help ground our understanding of the land struggle in Brazil in the context of the current global socio-economic and political framework. After a period of discussion, participants discussed the history of the Social Movement Working Group, followed by a general discussion of existing instruments/mechanisms provided by the human rights and environmental law framework on land, territory and other natural resources, with a special emphasis on the rights of indigenous peoples, women and small-scale farmers. Subsequently, social movement leaders entered into several sessions dedicated to sharing concrete experiences of utilizing human rights to defend the right to land, territory and other natural resources. 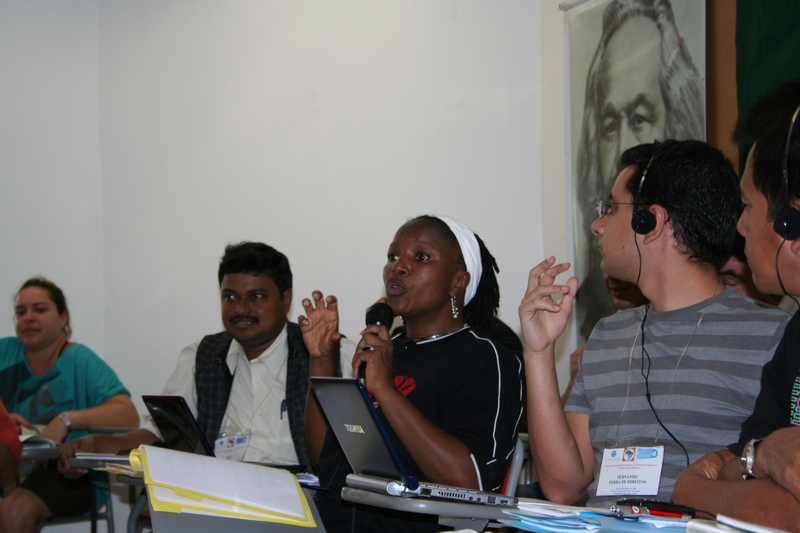 Experiences were shared from India, Nigeria and Brazil using national and international human rights mechanisms, and groups identified several opportunities offered by the environmental framework which includes an important emerging set of tools to advance human rights to land, territory and natural resources. After the first full day discussing concrete cases, victories and challenges in advancing land rights, the second day of the Workshop was devoted to sharing and identifying strategies and tactics that have been found particularly useful in securing rights to land, territory and other natural resources. We began by mapping out the strategies utilized by participants. 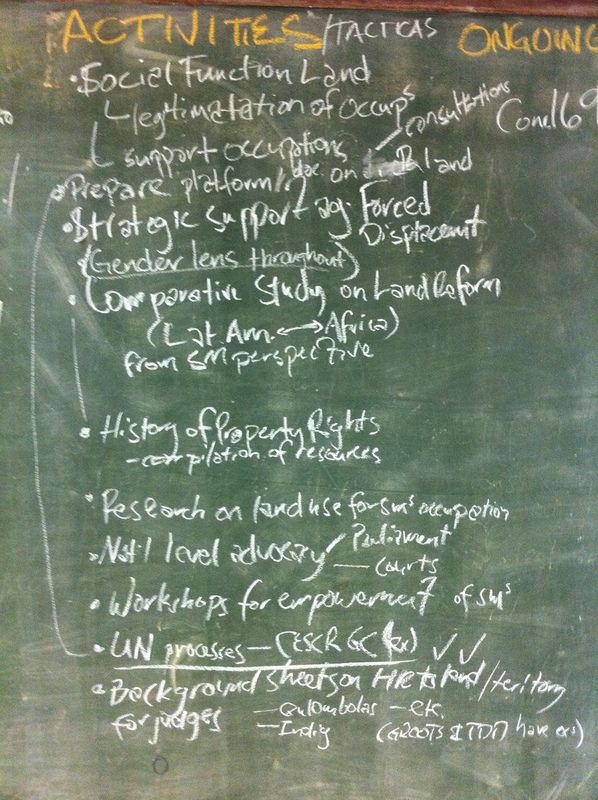 We then organized plenaries around the 3 broad clusters of strategies: 1) Integrating Local and National Action with International Advocacy, 2) Confronting the Criminalization and Repression of Dissent: Legal and Political Strategies to Secure the Right to Justice, and 3) Strategies and Opportunities for Alternative Sustainable Community Management of land, Territory and other Natural Resources. Following the plenaries, groups met in working groups to discuss specific strategies not touched upon in the plenaries. Topics discussed included: the use of media; litigation; the use of international systems and solidarity networking to advance and defend the right to land, territory and natural resources. For more information on the Social Movement Working Group's plans in this area, visit here. Following in the path of its first two Solidarity Visits in Thailand and Kenya, the SMWG's 3rd Solidarity Visits allowed participants to bear witness and learn from the experiences and past work of the host organizations, as well as provide the host communities a platform to share their knowledge, work and challenges and request support from an international network in their ongoing struggles. Participants visited two MST communities-Itapeva and Porecatú-both in very different circumstances. The Itapeva settlement was an inspiring example of victory in the face of a decades-long struggle to access land by MST communities. The communities we visited began land occupations in the 1980s, living in tents and organizing itinerant schools for their children, under constant threat of attack by local militias or police. Thanks to the strong organization and legal success of the Itapeva community, six settlements were created by the mid-1990s, where communities are now engaged in agro-ecology, contributing to their own food security in sustainable ways. Productive and marketing cooperatives have been set up to sell agricultural, medicinal and dairy products. What was once a one-room shack school is now a flourishing, high-tech complex providing primary and secondary education for children in the community. 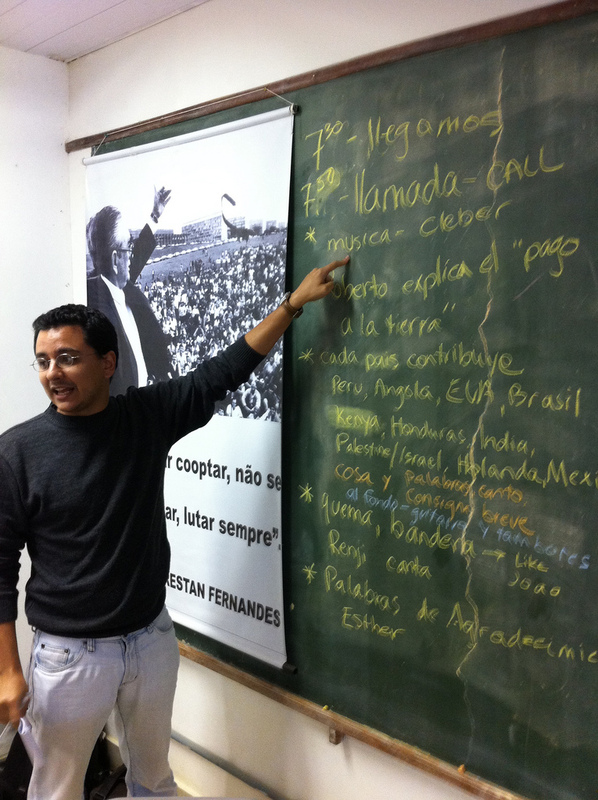 In Itapeva, participants were able to learn from MST community leaders in very concrete, tangible ways. 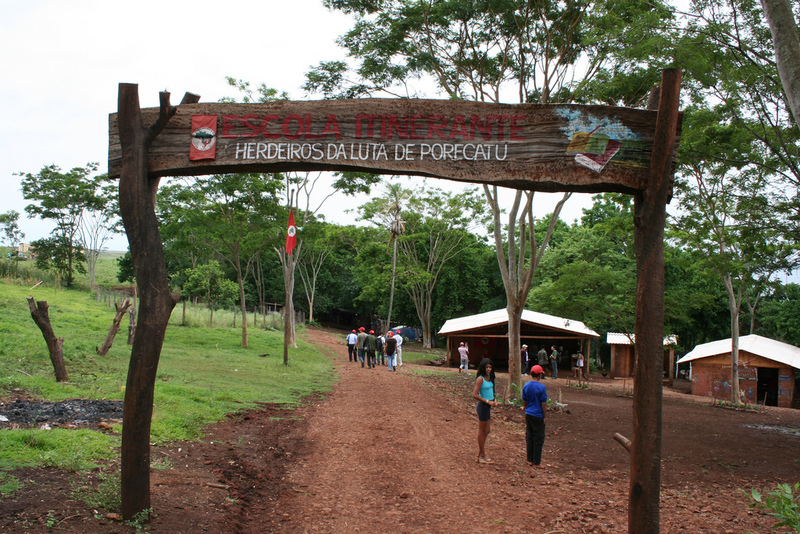 After Itapeva, participants travelled to Porecatú in Paraná state to visit the community of "Herdeiros da Luta de Porecatú," a camp set up by MST in 2008. Resisting threats of eviction and paramilitary attacks, the community leaders we met were bringing sustainable farming to the area, and demanding that the Brazilian state redistribute the land currently owned by large cane plantation owners allegedly involved in slave labor. During occupation, the families we visited developed an autonomous system of food production, organized an itinerant school and established relations with numerous allies, strengthening the fight fort land democratization, demanding dispossessions of illegal areas and denouncing crimes committed by local landowners. Participants learned from this struggle, but also recognized that the community faces significant challenges. They therefore discussed concrete ways in which their organizations through ESCR-Net might provide ongoing support and solidarity with Porecatú. An ESCR-Net produced documentary film- Human Rights By and For the People: Securing Economic, Social and Cultural Rights from Below- was also presented to participants during this time to help build their capacity-building on human rights instruments, law, mechanisms and strategies most relevant to shared struggles. Upon return from the Solidarity Visits, the Social Movement Working Group Strategy Session enabled participants to explore common strategies and collective work alliances for future campaigns, actions, learning materials and an envisioned System of Solidarity and Support (SOS). Participants set out to discuss and build a joint agenda for collaborative action on land, territory and natural resources, analyzing throughout the link between ongoing work of other ESCR-Net Working Groups and the participating groups. Three main types of actions emerged as areas of potential SMWG collaboration. First, participants saw great potential for strengthening international recognition of a human right to land and its implementation. Second, participants were interested in continuing to hold capacity-building sessions and developing learning materials on land rights. 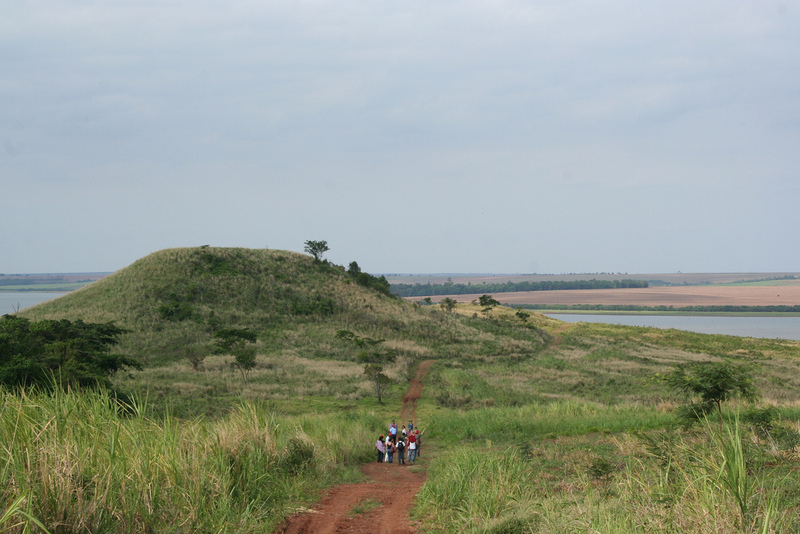 After witnessing first-hand the MST's legal victories in gaining access to land, groups were interested in developing future learning materials on property rights and human rights, particularly for identifying cases whereby the concept of the "social function of property" has been successfully employed in order to strengthen equitable access to land. A comparative analysis of land reform in Latin America and Africa (from a social movement perspective) was also suggested. Intense interest (especially from African participants) in learning the organizing methods, tactics and technical skills from MST and Via Campesina was expressed throughout, highlighting the need to develop mutual-learning materials on these skills, and to build more lasting alliances between movements to exchange political/technical expertise. Lastly, participants were eager to engage the broader ESCR-Network, in particular to provide concrete, strategic support to groups facing threats of forced displacement due to the presence of large-scale development projects in or around their lands, as well as to build a successful System of Solidarity (SOS). For an update of new developments from the Social Movements Working Group following from these discussions in Brazil, visit here. ESCR-Net's Social Movement and Grassroots Working Group (SMWG) celebrated its 3rd Solidarity Visits and Mutual Learning Workshop together with the Movement of Landless Workers (MST) and Terra de Direitos from the 8th to the 13th of November 2010 at the Escola Nacional Florestan Fernandes in Guarerema, São Paulo, Brazil.